It's funny... whenever I see a picture of a cool car in an advert or something, my brain will add the sound that I associate with such a car. If it's a Porsche, I can hear the smooth purring/whine of the tuned engine. The senses always work together to complete the big picture. 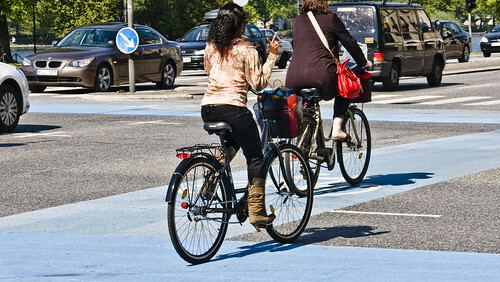 When I see a photo like this, of a Copenhagener riding a bicycle, my brain doesn't send audio signals. Instead, for some reason, I recieve olifactory sensations. I smell perfume. Or shampoo. 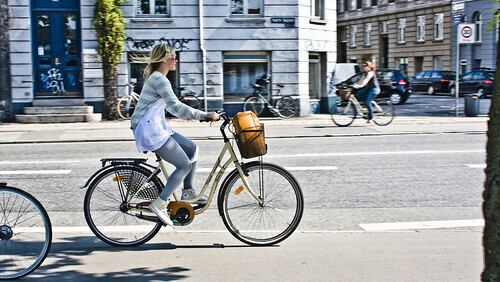 You'd understand if you rode around Copenhagen for a day. Bicycles are scented with fine perfume. There's the whole The Five Cycling Senses series if your brain wants more input. Another classic example of a Copenhagen signal. A vague wave of a couple of fingers. Busy City Hall moment. It's tourist season, so the streets are filled with camera-toting visitors. Copenhagen is the world's third largest cruise ship port, so we get a whole slough of daytrippers content only with taking photos of the sights before heading back to their ship after 4 hours. The other tourists, who spend more time, tend to blend in more on the urban landscape. 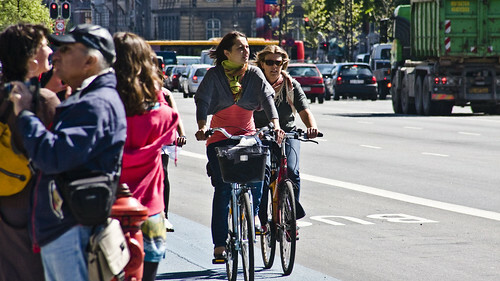 You have such a great blog on Copenhageners commuters and cool bikers, but I miss the pictures at my RSS feed reader. I just read that Denmark is the world's happiest country. It does say truly, madly, deeply, serenely happy if you can go around the city in a bike either for work or leisure. Hip-hip-hooray! To say I love your site would be an understatement. But please consider a way to subscribe to full posts via RSS. Adverts, a small fee... I really don't care, but if I have to keep clicking to read the full post I dare say the romance will dwindle. I agree with previous comments about having the pictures in the RSS feeder. I love your pictures but honestly since it's mostly what it is on your blog (one or two pictures with very little text), I don't want to click on a link for that. Is there a particular reason you are doing it this way now? I also miss the feed. Please bring it back so I can get my daily cycle chicness. I can't click on links to all the blogs I follow, and the rss is a great way of keeping track. Lovely photos but bring back the full RSS feed, thanks!